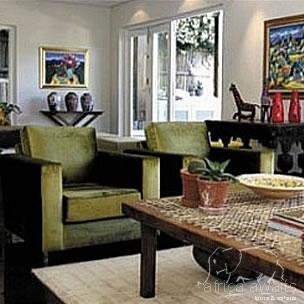 Four Rosmead is an exclusive boutique guesthouse situated on the slopes of Table Mountain in the select residential suburb of Oranjezicht. 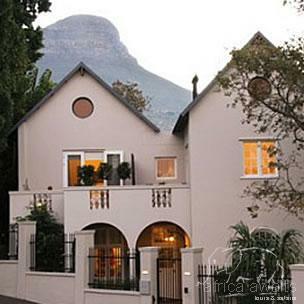 The guesthouse enjoys 360° views of the mountain, Lions Head, Signal Hill, Table Bay and the city. It is within walking distance of the city as well as vibrant Kloof Street, which is well known for its restaurant and cafe culture. Leeuwenzicht is a deluxe en-suite bedroom with an extra length queen size bed. 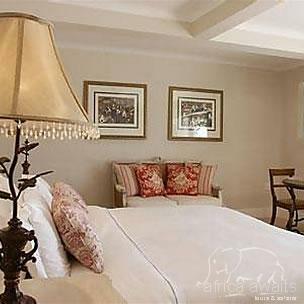 The room has a crisp airy feel and enjoys views of Table Bay, the city and Lions Head. Oranjezicht is a deluxe en-suite bedroom with extra length twin beds which convert into a king-sized bed, separate bath & shower. Enjoy a view of Signal Hill, Table Bay and the city, or have your breakfast on the balcony with Table Mountain as a backdrop. Oakmont is a deluxe en-suite bedroom with a queen sized bed, separate bath & shower. Sip your morning tea on the balcony with a view over Devil's Peak, which forms part of Table Mountain. Enjoy a glass of wine in front of the fireplace at night in the privacy of your own room. Oakhurst is deluxe en-suite bedroom with an extra length queen size bed. The room enjoys views of Lions Head and Signal Hill. Watch the sun set through your window after a relaxing day by the pool. Welgevonden is a luxury en-suite bedroom with a Victorian fireplace and extra length twin beds which convert into a king-sized bed. The room enjoys views of Bo-Kaap and Signal Hill. Beaulieu is a luxury en-suite bedroom with a distinct French flavour. It is situated on the ground floor and leads onto a provencale garden with a pond and fountain. Extra length queen-sized bed. Bellevue is a luxury en-suite bedroom with a distinct French flavour. It is situated on the ground floor and leads onto a provencale garden with a pond and fountain. Extra length twin beds All rooms have the highest quality linens, air-conditioning, heated towel rail, bath robes, hairdryer, satellite TV, telephone, bar-fridge, coffee and tea facility, electronic safe and internet access. Continental or full English breakfasts, Swimming pool with loungers, Landscaped gardens, Off street parking, Vegetarian friendly menu's, Broadband, wireless internet, Various invigorating therapies in the Pamper Spa. Airport transfers, Laundry, Theatre/restaurant reservations, English and French are spoken. With your holiday, safari or business trip from in to Four Rosmead Boutique Guest House in Cape Town.